There has been a huge influx of idol fanaticism in anime. Sure it’s always been a bit of a craze but it seems more prominent now than ever. The Japanese idol industry is huge, covering everything from songs and dancing to funny game shows and events. A large draw is the growth of each idol, often being scouted as a child to becoming a fully-fledged performer whilst still in school. Naturally, this is a perfect narrative for the anime medium. 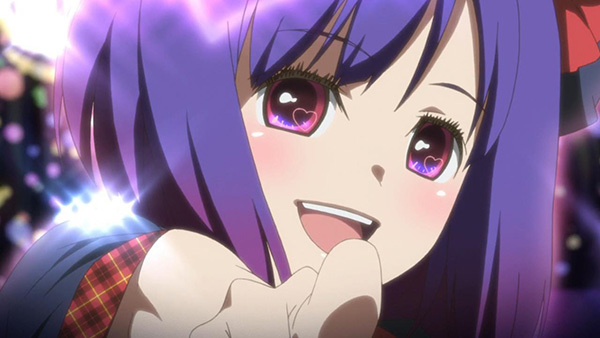 AKB0048 is based on the popular idol group AKB48 and, if I’m not mistaken, is actually one of the first idol anime to be localised and released for the Western audience. Contrary to almost every other work based on idols, AKB0048 has an extensive story behind it. After a devastating war on Earth, humanity flees its home to new worlds but is subject to strict rules in order to prevent another catastrophe. Entertainment and art are banned in a dystopian society controlled by the anti-music organisation DES. The once-legendary idol group AKB48 is forcefully disbanded and any fans are at risk of being prosecuted. Fast forward 48 years and the group is covertly resurrected as AKB0048, reinstating the old system of picking candidates to succeed each generation of girls and performing live in secret. All of this is done at risk of drawing the ire of DES who labels them as terrorists. A group of four young girls aim to be the next big AKB stars, going against their parents’ wishes and travel through space to reach their dreams. The whole setting is elaborate and almost silly as the undergraduate girls must dodge bullets all for the sake of protecting a J-Pop stage full of neon light sticks and dance maneuvers. 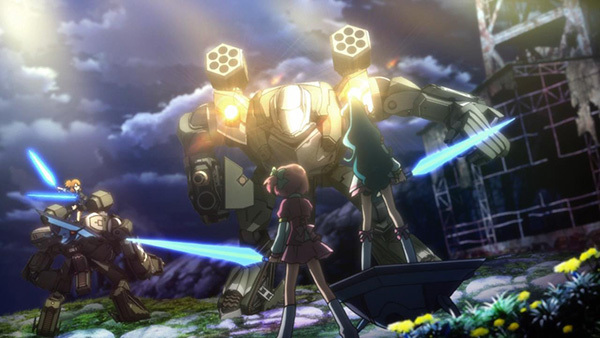 This is probably the first and only time you’ll see idols singing while mechs are raging on a battlefield nearby. The action parts, however, are not nearly as exciting as they sound and you begin to wonder why put them in at all. 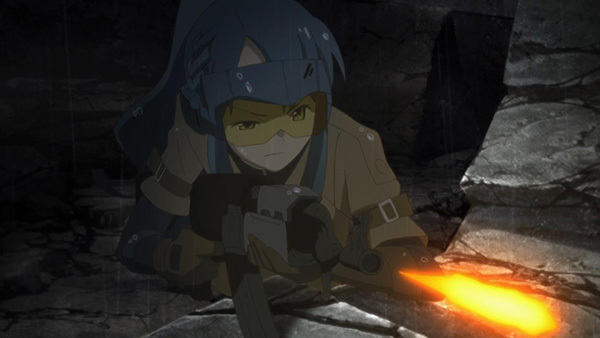 For all the live ammunition used, no one actually gets killed and since AKB0048 are only allowed to use non-lethal force the whole thing feels pointless and monotonous when action does happen. But that’s not why we’re here. You’d be glad to know the cute idols, songs and dances live up to the standards of the genre, utilising great CGI when performances are shown off and injecting some drama by giving us a glimpse of the challenges idols have to deal with. Don’t expect anything too complex regarding the inside workings of the industry though, as this is still essentially a promotion of AKB48 and it tends to glitz over what can be a very rough experience for idols at times. The first half ends with inspiration as our main character has her dreams finally accepted by her parents. This really is a tale of following your heart despite what your family, or even armed government authorities, want you to do. 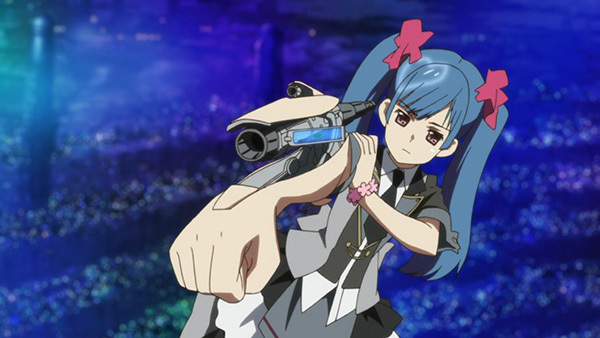 It’s hard to believe and even harder to explain but AKB0048 has a unique look. Character designs are simpler than most other anime, almost generic, and this sounds like a criticism but it’s actually refreshing for once. Each person looks distinct to match their personalities. The colours used throughout the show are bright pinks, blues and purples against a grey backdrop, reflecting the depressing ban on music. The best part is the animation when things burst into song and action. Satelight has expertly used CGI to make the whole thing look fluid, mimicking the expert dance moves of professional idols. 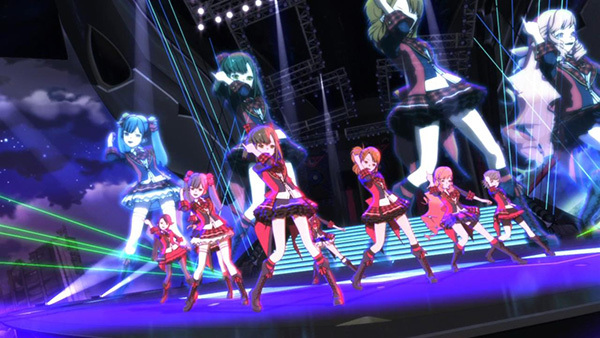 A great deal of effort went into replicating how an idol moves on stage and my only complaint would be that there wasn’t enough of it in these 13 episodes, possibly due to budget constraints. Being an anime that’s all about singing and dancing, you’d expect the music to be good. And it is, make no mistake, but at the same time it’s not that memorable either. Whether it’s due to a lack of catchy songs or distinct melodies is hard to say but the standouts for me simply remained the opening and ending themes, which are lovely. If you’re going into this anime, chances are it’s because you’re a fan of AKB48 and you can relate to the similarly sounding AKB0048 title. So it’s also likely you’ll probably just watch this in its original Japanese track. That’s not to say the English dub is bad, far from it, but it is jarring when background music is sung in Japanese while when it comes to the voice actor’s turns they adapt the lyrics into English. Again, they do a pretty good job of localising the songs and I was surprised how they managed to keep everything sounding natural. On the other hand, you’re watching a Japanese idol show most likely because you enjoy hearing Japanese idols in their own language. Hanabee’s DVD release comes with the standard on-disc features such as Japanese promos and clean opening and ending animations. If you’re a fan of J-Pop or Japanese idols as well as anime, this is a match made in heaven. But that also means it’s highly likely that you’ve seen other shows that blend idols and anime, even if it didn’t get an English release such as the excellent Macross Frontier which does a far better job at blending action with music while The Idolmaster is a more focused (and musically sound) look at a group of girls working their way to the top from the ground up. AKB0048 is bogged down in an overly ambitious setting with a “threat” that isn’t so threatening at all and action which, while looks very pretty, feels half-hearted at best. However, I understand the intergalactic sci-fi setting contributes to the dazzling depiction of the idols and the ban on music is actually a cool and fresh idea. Here’s hoping the second half adds more of what we want to see; music, dancing and interpersonal drama related to the idol group, rather than pointless battles. 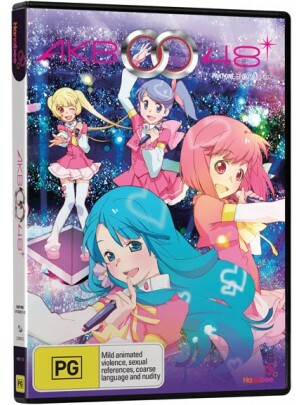 Judging from the first half, this is still an enjoyable idol anime and is, quite frankly, the only one of its kind that can be bought off Australian shelves right now.